Hard infrastructure is the physical infrastructure of roads, bridges etc., as opposed to the soft infrastructure of human capital and the institutions that cultivate infrastructure. This article delineates both the fixed assets, and the control systems, software required to operate, manage and monitor the systems, as well as any accessory buildings, plants, or vehicles that are an essential part of the system. Also included are fleets of vehicles operating according to schedules such as public transit buses and garbage collection, as well as basic energy or communications facilities that are not usually part of a physical network, such as oil refineries, radio, and television broadcasting facilities. These are physical assets that provide services. The people employed in the hard infrastructure sector generally maintain, monitor, and operate the assets, but do not offer services to the clients or users of the infrastructure. Interactions between workers and clients are generally limited to administrative tasks concerning ordering, scheduling, or billing of services. These are large networks constructed over generations, and are not often replaced as a whole system. The network provides services to a geographically defined area, and has a long life because its service capacity is maintained by continual refurbishment or replacement of components as they wear out. The system or network tends to evolve over time as it is continuously modified, improved, enlarged, and as various components are rebuilt, decommissioned or adapted to other uses. The system components are interdependent and not usually capable of subdivision or separate disposal, and consequently are not readily disposable within the commercial marketplace. The system interdependency may limit a component life to a lesser period than the expected life of the component itself. The systems tend to be natural monopolies, insofar that economies of scale means that multiple agencies providing a service are less efficient than would be the case if a single agency provided the service. This is because the assets have a high initial cost and a value that is difficult to determine. Once most of the system is built, the marginal cost of servicing additional clients or users tends to be relatively inexpensive, and may be negligible if there is no need to increase the peak capacity or the geographical extent of the network. In public economics theory, infrastructure assets such as highways and railways tend to be public goods, in that they carry a high degree of non-excludability, where no household can be excluded from using it, and non-rivalry, where no household can reduce another from enjoying it. These properties lead to externality, free ridership, and spillover effects that distort perfect competition and market efficiency. Hence, government becomes the best actor to supply the public goods. In 1990, Grübler discussed the history and importance of transportation infrastructures like canals, railroads, highways, airways and pipelines. The OECD classifies coal mines, oil wells and natural gas wells as part of the mining sector, and power generation as part of the industrial sector of the economy, not part of infrastructure. Electrical power network, including generation plants, electrical grid, substations, and local distribution. Natural gas pipelines, storage and distribution terminals, as well as the local distribution network. Some definitions may include the gas wells, as well as the fleets of ships and trucks transporting liquefied gas. Petroleum pipelines, including associated storage and distribution terminals. Some definitions may include the oil wells, refineries, as well as the fleets of tanker ships and trucks. Specialised coal handling facilities for washing, storing, and transporting coal. Some definitions may include Coal mines. Steam or hot water production and distribution networks for district heating systems. Electric vehicle networks for charging electric vehicles. Coastal management, including structures such as seawalls, breakwaters, groynes, floodgates, as well as the use of soft engineering techniques such as beach nourishment, sand dune stabilisation and the protection of mangrove forests and coastal wetlands. OECD lists communications under its economic infrastructure Common Reporting Standard codes. 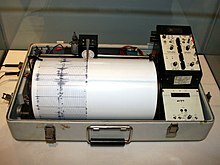 A Kinemetrics seismograph, formerly used by the United States Department of the Interior. ^ "The Difference Between Soft And Hard Infrastructure, And Why It Matters". StateImpact New Hampshire. Retrieved 2017-10-29. ^ Myles, G. D. (1995) Public Economics. Cambridge University Press. 263-264 pg. ^ a b OECD Economic Infrastructure. Common Reporting Standard (CRS) Codes 2 pages, n.d.
Ascher, Kate; researched by Wendy Marech (2007). The works: anatomy of a city (Reprint. ed.). New York: Penguin Press. ISBN 978-0143112709. Hayes, Brian (2005). Infrastructure: the book of everything for the industrial landscape (1st ed.). New York City: Norton. ISBN 978-0393329599. Huler, Scott (2010). On the grid: a plot of land, an average neighborhood, and the systems that make our world work. Emmaus, Penn. : Rodale. ISBN 978-1-60529-647-0. Look up infrastructure in Wiktionary, the free dictionary. This page was last edited on 6 April 2018, at 23:13 (UTC).